A huge genus of plants usually broken down into various groups but just listed here 'as they come' in alphabetical order. The varieties we grow are the best of the easier ones which should do well in most gardens without special attention or knowledge. The next group is the silver, or encrusted types and the ones we grow most of. Very different to the mossies, they grow as hard clumps of paler green, (often) silvery leaves. This silvering is actually lime the plants take from the soil and deposit on their leaves which become 'encrusted'. They are often slow-growing making them suited to growing in stone sinks or troughs, or where they can develop slowly without crowding from more vigorous neighbours. Flowers are borne on long, usually erect or arching stems in summer. They like sunshine and a gritty soil but the ones we offer aren't difficult. 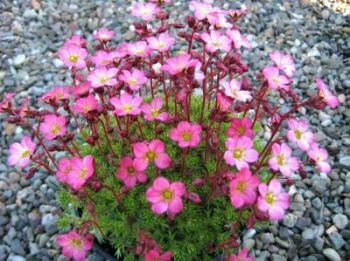 We also a silver Saxifraga collection. Another large group is the early flowering group (once called 'kabschia', now Porphyrion) but we only offer a few varieties. Other growers specialise in these. They are usually very slow growing and flower in early spring. Excellent trough plants. The last group is - everything else! But special mention must go the S. oppositifolia varieties. These grow really well in most of Scotland where it is cooler and more moist. They are true mountain plants and can be found in special places on many of the high hills in the UK. Another plant I should mention (and a favourite of ours) is S.x primulaize 'Salmon' - this a summer flowerer with sprays of bright orangey-red flowers, very unusual and very eye-catching.